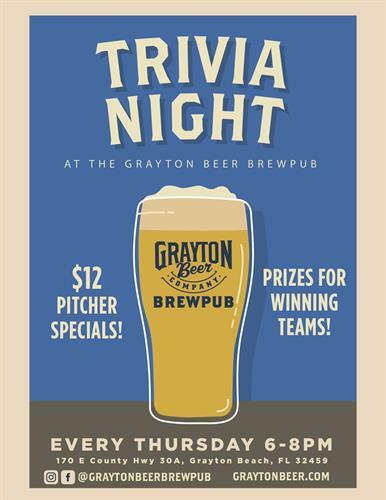 Grayton Beer Brewpub will host Trivia Night weekly! Join us from 6-8 PM every Thursday to test your knowledge on a variety of topics against competing teams. Enjoy $12 Pitcher Specials, small-batch beers, craft cocktails and dinner. Teams of 6 are best, but if you don’t have 5 friends, come make some! Prizes are awarded to 1st, 2nd and 3rd place teams.